It is likely that a wrought iron fence has caught your attention at least once in your lifetime. The beautiful elegance and sturdy nature of this type of fencing draws many in. If you are looking to add a fence, while making a statement and enduring little to no maintenance; a Minnesota Wrought Iron Fence Installation may be your best answer. How long does a Wrought Iron Fence Last? This type of ornamental fencing lasts a good 60 years or so! Remember not every wrought iron fence is built the same but the selection we offer is weatherproof and built to last, even in the harsh Minnesota weather. Wind Resistant – Because of the design of this fencing, it has no problem holding up in heavy winds. Fence with a View – Keep your view, the open picket structure allows for you to see though to the other side. Pest Resistant – This fencing option is Pest Resistant; no critters or bugs are looking to make a meal out of this fencing type. Highly Durable – Wrought iron fencing is Extremely Durable, what may bring down a wood or even vinyl fence won’t even make a dent in an ornamental fence structure. Never Goes out of Style – In no way, ever, has a wrought iron fence gone out of style. 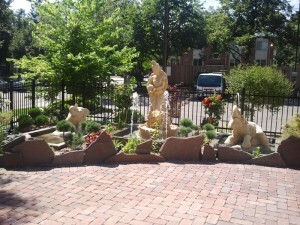 Which makes this fence selection an eternal addition that will keep it’s value and appeal. Higher Installation Costs – Because of it’s durability, installation in more labor intense and the product itself costs more. 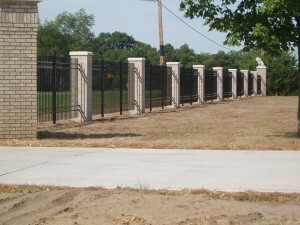 Your upfront costs will be a lot higher than most other fence selections. But when you consider it is a 60-year investment, the costs even out. 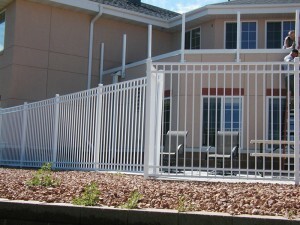 Less Privacy – If your goal for fencing is privacy, a wrought iron fence may not be for you. There are no designs that allow for complete privacy. Expensive Repairs – If or when the weatherproof coating wears or damages somehow do occur, repairing the fence will be costlier than most other designs. But these are seldom needed when dealing with our products and fencing company. Contact Arrow Fence Co today for a FREE on-site estimate of your desired Minnesota Wrought Iron Fence Installation (763)755-0088.